Quick question: I'm going to bespeak my wedding suit (stroller), and I had been looking at Dugdale's new fine worsted and Lesser tropical. Does anyone have experience with both and how do they compare? No experience with Lesser's tropical, but I've made 3 coats out of New Fine Worsted. It's one of my favorite cloths - light, crisp, and crease-resistent, but doesn't feel flimsy at all. Great variety of colors. I will try to post some pictures of a light green coat I recently finished. Another option is Harrison's Frontier. I have some of this stuff but haven't made it up yet. Seems like a nice cloth. Maybe not as crisp as Dugdale. You won't be disappointed if you go for the NFW. What color/style are you considering? I'm unsure what you mean by 'stroller' can you elaborate? Both bunches are well regarded anyway. I'd call that a double-breasted blazer myself but no matter. What type of climate will you have your wedding in? English summer. I like the look of the classic dark top/grey stripe or checked trousers, but was planning on ordering the jacket as part of a deep charcoal suit, so as to enhance versatility. Single-breasted, peak lapel, DB waistcoat. According to wiki a stroller is an American term for a semi formal black lounge... I always thought it was an I- gent term myself. So it's a black lounge with morning stripe trousers. To tailor a stroller maybe is a good idea and walk around with. I think I never saw someone in Houston with a stroller. How about a waist coat for the stroller? Well, given the fact that my old charcoal suit (first one I ever bought) is getting on a bit, and will need to be replaced soon, and that I'm in academia, which means I usually wear informal suits or sports coats, I thought to get a three-piece charcoal suit, with a further pair of striped or checked trousers and an extra odd waistcoat. This would mean I have a decent three-piece charcoal suit whenever necessary, a semi-formal morning outfit whenever I feel like it, and a colourful wedding raiment. For the wedding, I'd combine the charcoal coat with striped trousers, buff waistcoat, a light blue Winchester suit and a navy Drake's tie. This is a very versatile outfit. As you said, you can wear it as part of a suit, or with the morning formal trousers. Dugdale's New Fine Worsted tailors pretty well and is nice to wear. Breatheable open canvas weave, but enough body to keep a sharp look and be worn in spring and beginning of autumn. Might even be wearable in colder season with a waistcoat. 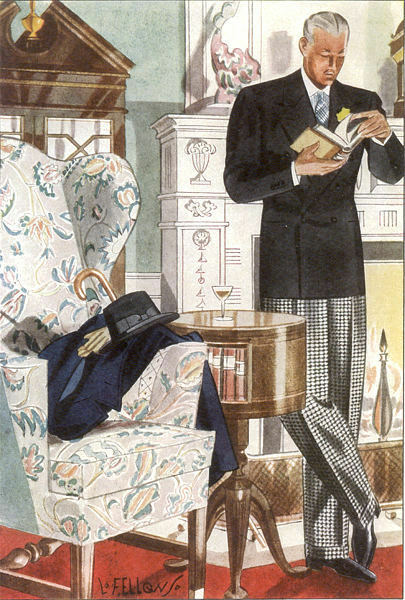 You can find many formal stripes for trousers in the Formal bunch from Dugdale, as well as some houndstooth. No idea where to find formal checks, though, please share with us if you find some. Even a basic shepherds check is hard to find in trouserings (all I have are jacketings). You can find a nice buff for your waistcoat in the New Fine Worsted bunch, so that it suits well the coat. I've made a wedding outfit like this. You could send me a picture of that outfit privately, so I can see which fabric you choose and how it looks like. Sorry, I wasn't clear. I made a suit with charcoal coat and trousers, plus a buff waistcoat, all from New Fine Worsted bunch. I'll look if I have pictures of it, I think I do (it was for a wedding). I haven't been asked for a stroller / black lounge with stripe trousers yet, though a friend of mine has. I can ask him if he has pictures. I'm not sure the one he made had a WC. Once I get everything made up, I'll post here as well. By the way, Dugdale just told me that the NFW bunch will be renamed (Panache) and upgraded. It's becoming slightly heavier (8-9oz to 9oz) and all patterns will be upgraded. Price is going up a little as well, bringing it close to Lesser's Superfine Tropical for CMTers like myself. Photos aren't online yet, but from the descriptions (fawn with sky and white triple pin stripe), it seems that there will be some fun to be had. Even a basic shepherds check is hard to find in trouserings (all I have are jacketings). Sorry for being off topic and for asking this naive question: what is the difference between jacketing and trousering fabrics? Is it just a matter of patterns or is there also some weave or finishing issue? Why not using jacketing for trousers? Edited by gramountoto, 18 December 2012 - 03:18 AM. Most suits are made from same weight and weave. A suit is a suite or ensemble, so the inference of matching or mated pairing exists in the name. Separates is a different matter. In the case of coordinated items (I.e. a costume in old parlance) one typically coordinates finishes to achieve a result. In separates, a bottomweight trouser would typically be made from a more durable fiber or weave because it will coordinate with several items in the wardrobe. It's a matter of practicality versus matching. When a customer buys in this manner, the design constraints need to be elicited, thus: questions like lifestyle, formality level, morning/daytime/evening, climate, etc. That's not to say that you can't commission a suit and "break" the pair in your wardrobe so you have more options for combining your daily costume. The inference for breaking a suit is that the "highest" event the wardrobe can handle is "professional". Special occasions may compel other, incremental purchases. I have just had a three piece suit made in the Dugdale Formal houndstooth (8711 I think). I like it and the tailor was happy with it too. I recently cut some black and white checked trousers. Fabric was purchased at Archie Fine in Toronto - a great place with a great selection of fabric and service, and strictly tailoring fabrics. Sometimes, it's just a matter of pattern, and there is no technical problem making trousers out of the cloth. Usually, it is loud, coloured patterns, and it is bold style to make trousers with it, but no technical problem. Of course, it is always possible to make a coat from trousering. Cloth specifically designed for trousers is frequently quite simple is pattern, frequently solids, durable, and in colours easy to match with many coats. Strangely, real flannel is soft, spongy, deforms easily, and is still used for trousers. But they are well known not to last very long. Some flannels have more resilience, but they don't have the same hand as real, spongy flannel.